Someday those words of gratitude might mean something to her, might make her proud instead of sad. But today, they are a cold comfort. The bereaved could equally be a husband, father, sibling, son or daughter"they are all alike in their devastation, in wondering how life can possibly go on. A loved one is gone, along with their dreams, hopes and plans for the future. It’s not easy for the Soldiers who conduct the funeral ceremonies either. Handing that flag over is “extraordinarily tough,” said Staff Sgt. Shawn Hall of The Old Guard, who has had the responsibility numerous times, although the task is usually given to a military chaplain or flag officer. It’s also “an absolute, utter honor,” he continued"the very least the nation can do to honor the men and women who gave the last full measure of devotion. 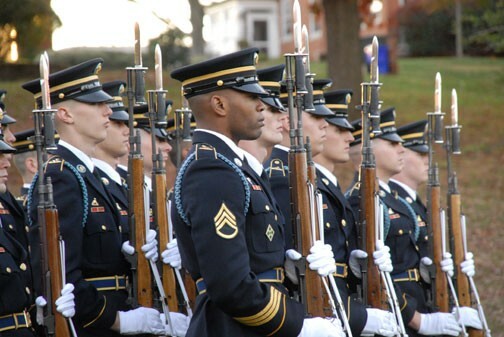 Soldiers from the 3rd Infantry Regiment (The Old Guard’s unit designator), perform as many as six funerals a day at Arlington National Cemetery in Virginia. 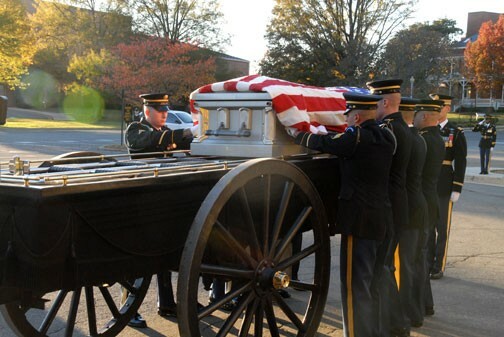 They serve as casket bearers, like Hall (who most recently was the memorial affairs noncommissioned officer in charge), members of the firing company or the honor guard and horse-riding caisson Soldiers. 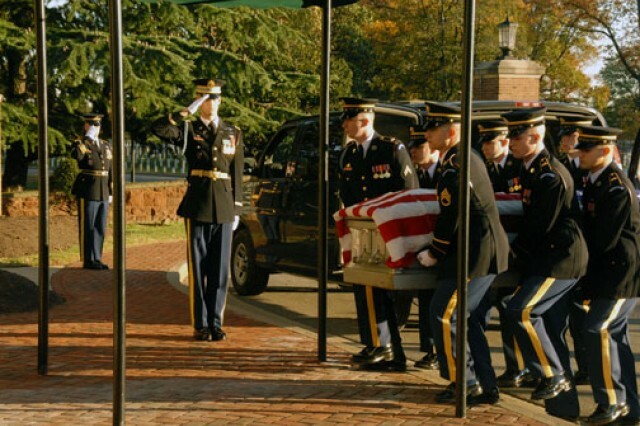 By the end of a two- or three-year tour in The Old Guard, it’s not uncommon for a Soldier to have performed 100 or more funerals for servicemembers, from veterans of World War II and Korea to young Soldiers killed in action in Iraq and Afghanistan. Old Guard Soldiers also spend a lot of time training for those funerals. They go through at least three weeks of intensive training when they join the regiment, but it doesn’t end there. 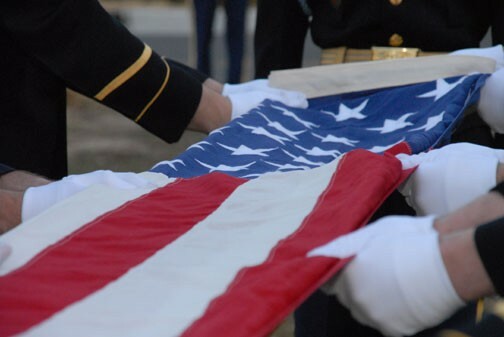 Any time a Soldier isn’t at a funeral or ceremony is spent rehearsing, practicing key portions like the flag folding and the 21-gun salute, which requires precise, synchronized movements. “It’s all about timing,” Spc. Robert Ververs, who serves in Alpha Company, 4th Battalion’s firing platoon, said. “Everything has to be in sync. When we’re in the (firing) party, your hands, your shots"everything has to be in sync, which is the hardest part. Your shots are supposed to be identical so when you have all seven shots ringing, it sounds just as one.” It’s not an easy task. 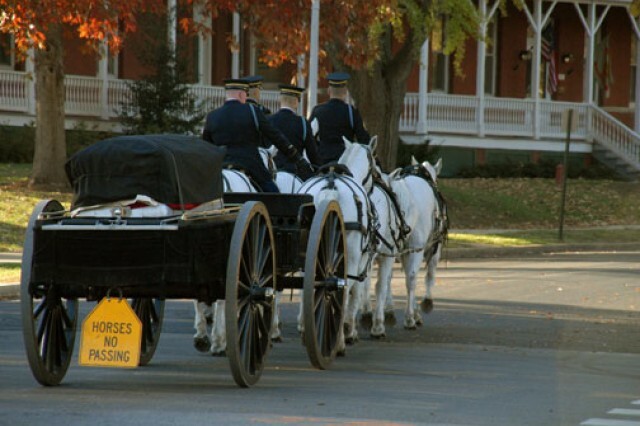 Nor is carrying a 300-700-pound casket an average of 100 meters while marching in cadence. Depending on the funeral, the load may be split between six or eight Soldier-casket bearers, but that 100 (occasionally 300) meters still feels like a very long distance, Hall said"especially if the casket is on the heavy end. Once, Old Guard casket bearers even had to carry a 1,200-pound casket up the steps of the Capitol, not an experience Hall recalls fondly. Their Army Physical Fitness Test scores alone are at least 250, and there’s a height requirement too"at least 5 feet, 10 inches for men and 5 feet, 8 inches for women. They’re even assigned to individual companies based on height. 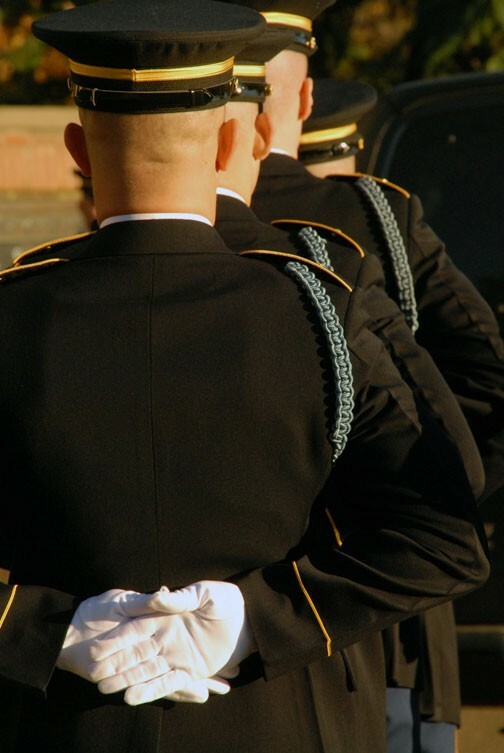 Their size matters because Soldiers in The Old Guard, an all-volunteer unit, often represent the Army at high-profile events and ceremonies such as presidential inaugurations and funerals, so they need to stand out and look sharp on TV. 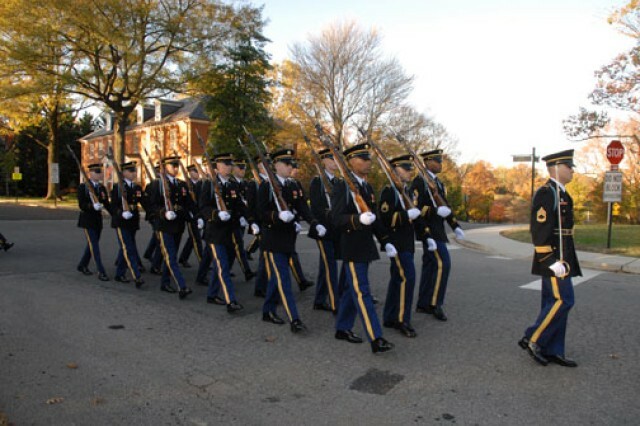 Because Old Guard companies are so in-demand, they sometimes travel around the country for months at a time (especially during the summer) to participate in different ceremonies and events that spread the Army’s message. It’s easy to get out of practice when they’re away, so the Soldiers rehearse every aspect of a funeral once they return under the watchful eyes of battalion and regimental leaders. They actually grade the Soldiers’ performance, so it’s a high-stakes training exercise, explained Capt. John P. Rodriguez, a platoon leader with Alpha Co., 4th Bn. “Our company has been out of the cemetery for about six months because of different ceremonies we’ve been doing in D.C. and around the country,” he said. “So before we go back to the cemetery for the (upcoming) season, we do several weeks of training to make sure that we are up to the standard.” The casket is empty and the burial plot is roped off rather than dug, but other than that everything is the same. 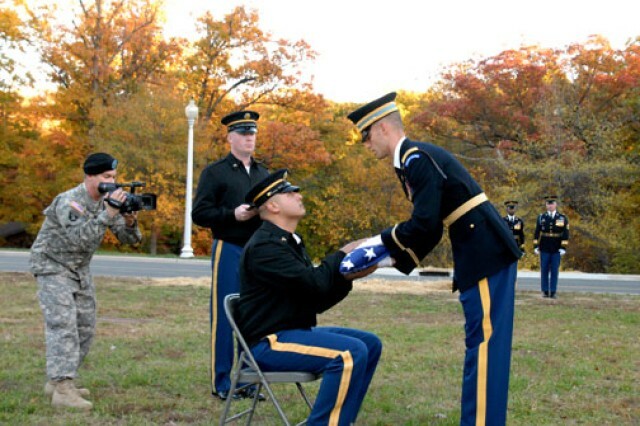 Someone even portrays a grieving relative while a Soldier hands over a flag. “What you’re going to see today is a full-honors funeral,” he continued before a rehearsal last fall. “This would be given to any (servicemember) who dies on active duty in Afghanistan or Iraq, or any officer up to the grade of lieutenant colonel. 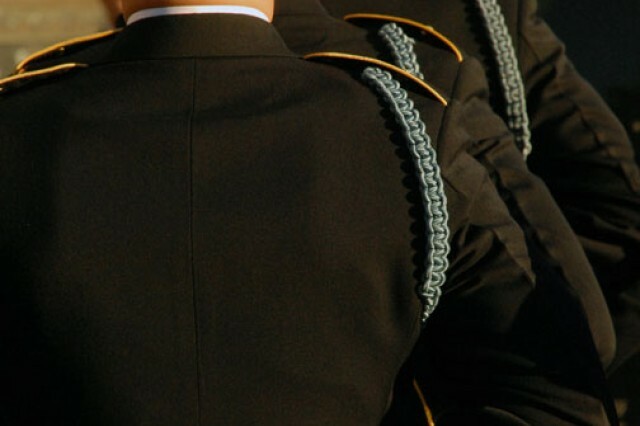 Soldiers who die at different ranks or retired Soldiers would get a slightly different ceremony. They did a great job, said Hall, one of the evaluators, but the training doesn’t stop there. Once a company has been assigned an upcoming funeral, they continue preparing up until the last minute, said Capt. Paul Brown, The Old Guard’s regimental ceremonies, special events and memorial affairs officer. He’s also served as the officer in charge during funerals. The night before a funeral, the Soldiers rehearse the sequence and prepare their uniforms, making sure they’re perfectly creased and spotless. The morning of a funeral, they go to Arlington before the cemetery opens and inspect the gravesite so everyone knows where to march and stand. An hour before the ceremony, they’ll talk it through and rehearse one last time. “The hardest part is that regardless of conditions, we have to do it right. It has to be 100-percent correct. It’s an honor because I’m here to make sure that everything is done and that everything is efficient and we do the best that we can. For the Family, this is the last thing the Army’s able to do for them, for their Family member’s sacrifice. This is often the last thing they will see from the military. 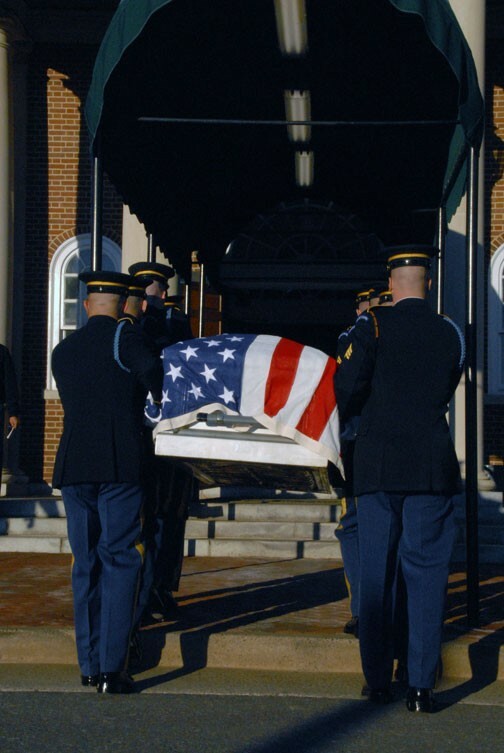 It has to be the best,” Brown said, adding that he volunteered for The Old Guard specifically to serve at funerals and honor the dead. One of the toughest portions of their training is how to maintain ceremonial composure. No matter how emotional a funeral is or how much a Family cries, Old Guard Soldiers must be able maintain their own composure and military bearing when putting their comrades to rest. 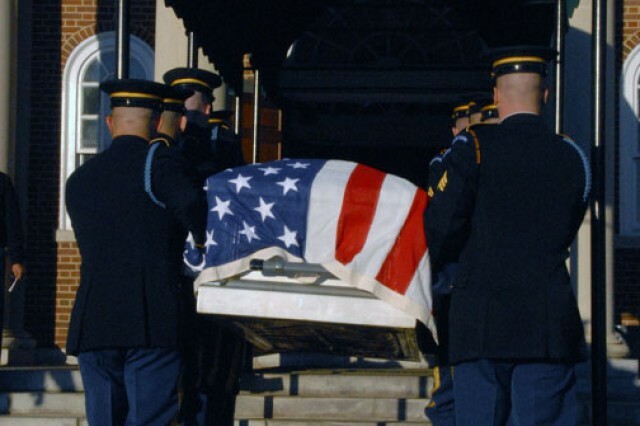 They must perform their duties and honor the late Soldier while not intruding on the Family’s grief. It takes practice and self-control. Nothing can truly prepare that Soldier for the day he will have to stand at attention on the thick green carpet of grass at Arlington, stone-faced in the presence of such heartache, however. The only way to get through such poignant, painful moments is to focus on the mission, Brown said. He thinks about the next step, the next command, the next task. 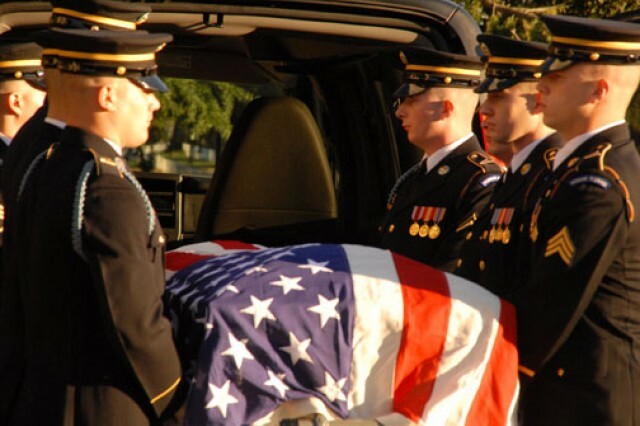 Old Guard Soldiers cannot offer grieving Family members a hug or a shoulder to cry on"performing a flawless funeral ceremony is the only form of comfort they can provide. Those Families are often sources of inspiration to Soldiers of The Old Guard, a reason to work a little harder, to stand a little straighter. “For the casket team, it serves as a motivator, as odd as that may sound,” Hall said. “Everyone’s going to get the same honors and everything is going to look great for everybody, but sometimes a nerve is just struck. You connect with it on a personal level and you just say, ‘You know what? Let’s give it the best we’ve got.’ Any amount of fatigue you may have felt carrying the casket to its final resting place or anything else, it just goes away. It helps keep your mind strong to push through that…because you want to pay that Family the proper respect. “Me personally, when I hear a Family (crying), I actually focus on the sound of the emotion. And then my thoughts would go to the young man or woman, or older man or woman, who was in that casket, and I would start thinking about what their life was like in their time in service and stuff like that, and that makes me want to be even better,” he continued. Hall would sometimes watch as grown children or grandchildren finally realized the significance of their fathers or grandfathers’ service, learned that the family men they knew and loved had once made major sacrifices for their country. Those instances of dawning pride and patriotism in adult children warmed Hall’s heart and sharply contrasted with moments that chilled him to the bone. As the father of two young daughters, his hardest funerals were always when a young Soldier left small children behind. He would look at them as he presented the flag and see his own little girls. “They’re seeing their daddy in me and I’m seeing my child in them, and to be able to walk that razor’s edge of professionalism while holding emotions at bay…that’s something else. But there’s also, at the end of the day, a feeling of fulfillment that you get because that child, when they grow up and see that flag sitting up on that mantle, and that’s their memory of their father, they’re going to remember me too,” he explained. And at the back of his mind is the fear that next time it could be his own funeral, a sentiment that Ververs echoed. Editor’s note: For more information about The Old Guard and military funerals at Arlington, visit http://www.army.mil/info/organization/unitsandcommands/commandstructure/theoldguard/ and http://www.arlingtoncemetery.mil/.